Little bluestem sticking up through a foot or more of snow. It’s been a long, long, cold winter this year. I’ve been feeling unmotivated recently when it comes to taking outdoor photos… it’s snow and more snow. I feel like been there, seen that, probably already photographed that. Then I woke up and stepped outside into the golden hour just around sunrise. 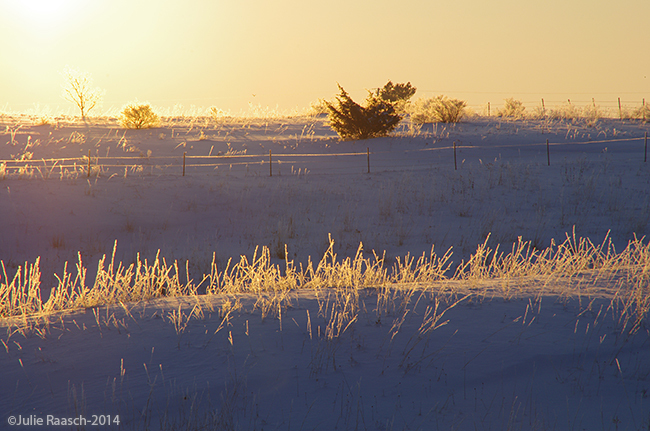 The sun’s light was passing across the prairie in wonderful ways, things were covered in hoarfrost and out came the camera. Sunshine across the prairie. Indian grass, little bluestem, and pale purple coneflower seed heads. The sun had not yet crested the ridge on the other side of the prairie and the light was falling on the snow, coloring it shades of pink and blue. 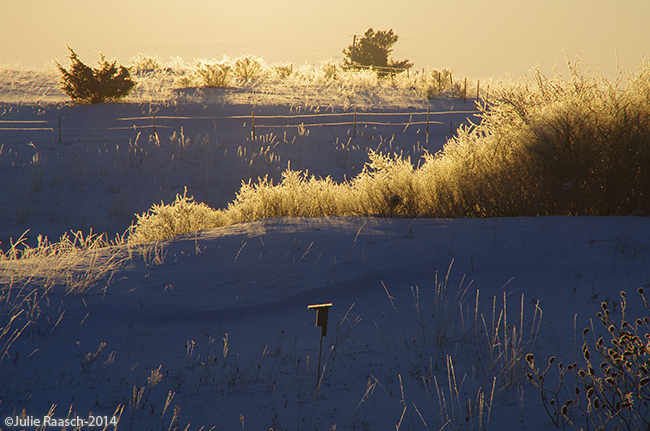 The rays were passing through the hoarfrost causing plants to appear to glow. So while I may have been getting tired of all the winter and snow, this scene reminded me of the beauty of winter. So while winter may seem to be dragging on forever, I will enjoy the beauty of it while it’s here. These are a few images I took to capture it all… enjoy! 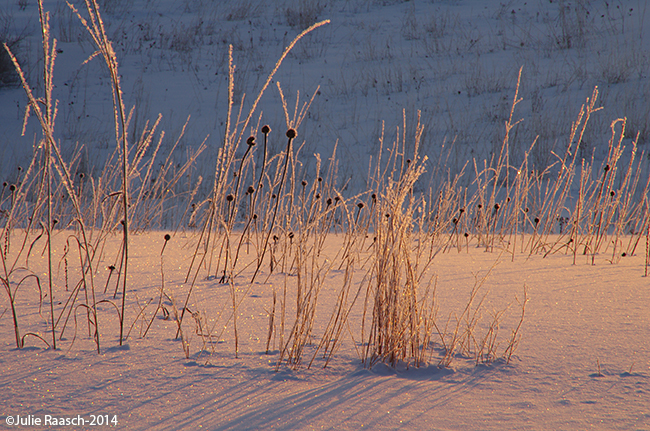 Pale purple coneflower heads and prairie grasses poking through the snow. Note the shadows cast by the sun rising behind them. 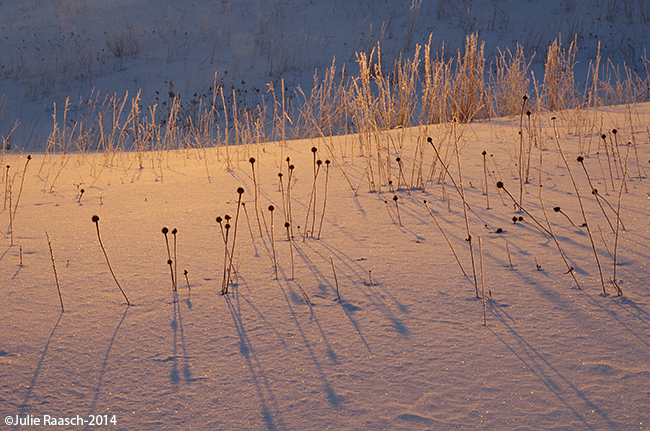 As the sun rises above the ridge it causes the plants to glow as its light hits the hoarfrost. 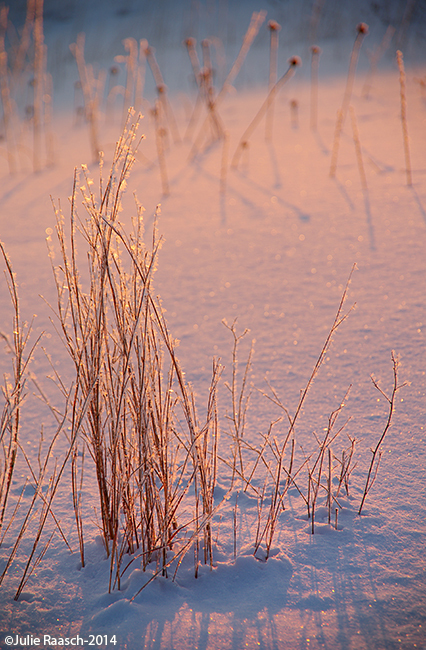 Sun passes through the hoarfrost covering plants, making them look like they glow. 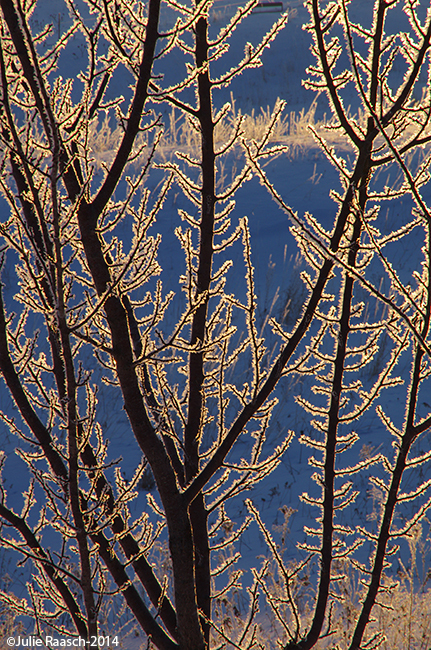 with sunlight streaming through the hoarfrost. To view all the images from this photo shoot, plus other photos visit my Facebook page for Hoverfly Studio. The photo I started with. The one where the most children looked the best. 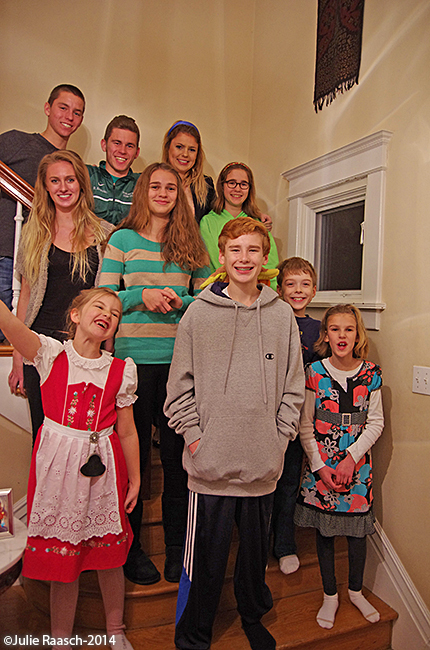 Every year I take a photo of my nieces and nephews. This a tradition started for my Grandmother’s benefit, but one that has continued on after she passed a couple years ago. She mentioned that she did not have enough room for individual photos of all of her great grandchildren (~20) in her small apartment… not even on the refrigerator. 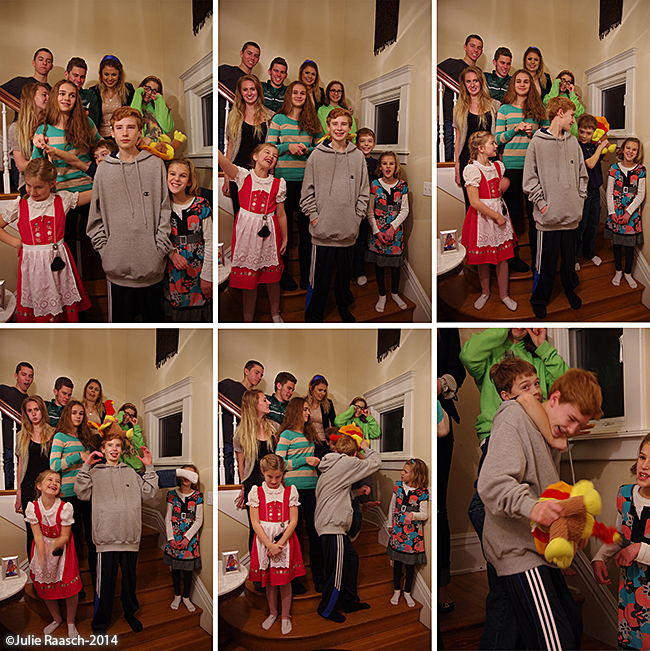 So for Christmas I took a group photo of all my nieces and nephew… thus a tradition was born. 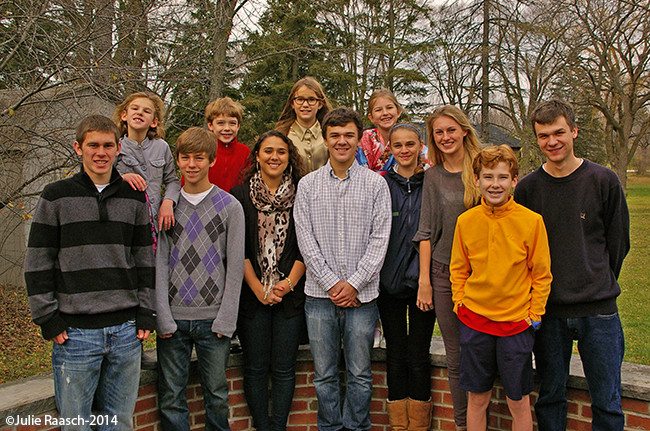 I usually shoot the photo when we’re all together for Thanksgiving. I then make enlargements for my Grandmother, Parents and Sisters. In addition to being a nice gift it is also an interesting recording of them as they grow up. This year there were a few hiccups during the photo shoot and while they are all old enough that it should have been easier to capture a photo with all of them looking their best it did not happen. 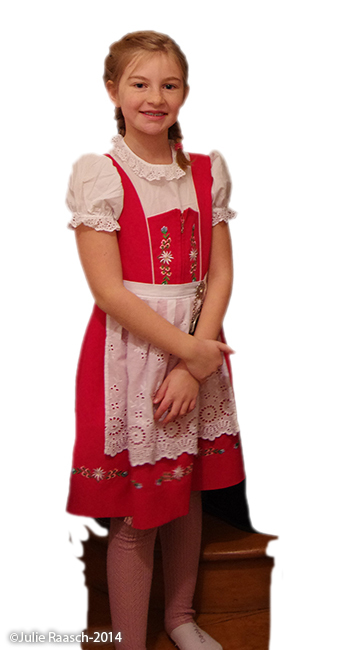 The ideal is to get the perfect photo in one shot, but when that fails I have to do some photo retouching in PhotoShop. 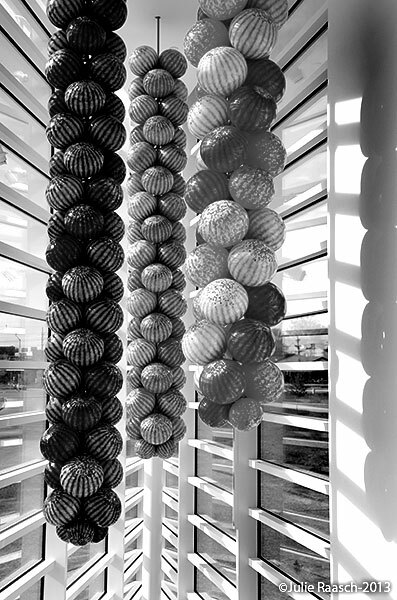 Below are a couple of pieces taken from other photos and layered into the photo I chose to start with. After some cloning, airbrush work, and blending in the pieces cut from other photos I have a photo where everyone is looking their best. L cut out of another photo to be added to the finished photo. 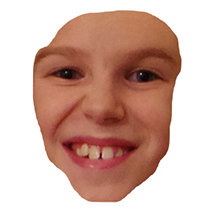 E’s face from another photo. Once on a layer, I softened the edges and blended the skin tones so it looked like part of the finished photo… color and tone. The finished photo that I gave out this year for Christmas to my family. 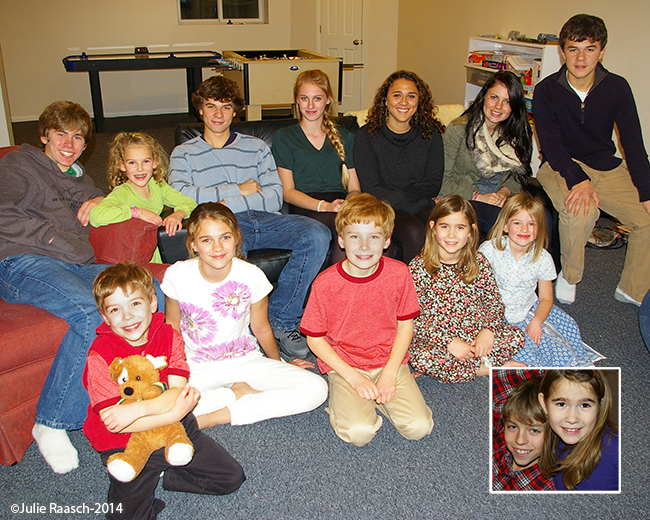 Below are some photos of my nieces and nephews over the years. Group photo 2012. 10 nieces and nephews, plus my sister’s fiancé’s 3 children. Group photo 2011. 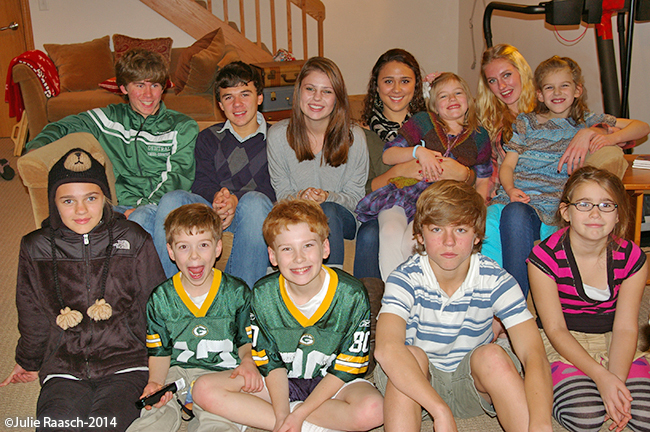 10 nieces and nephews, plus 2 of my sister’s fiancé’s children. Group photo 2010. 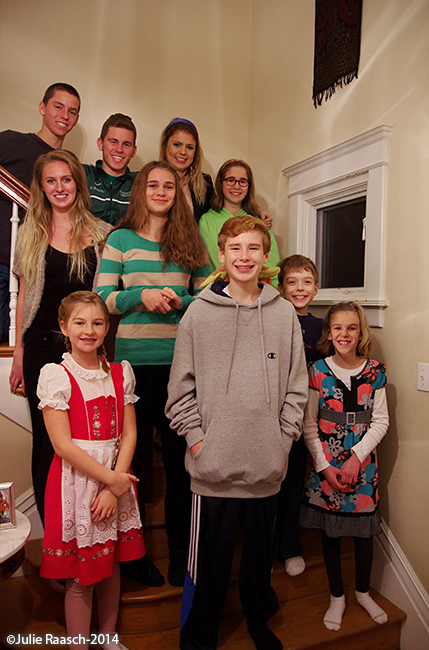 9 nieces and nephews, plus 2 of my sister’s fiancé’s children. There is an inset because one of my nephews had left by the time the photo was taken. 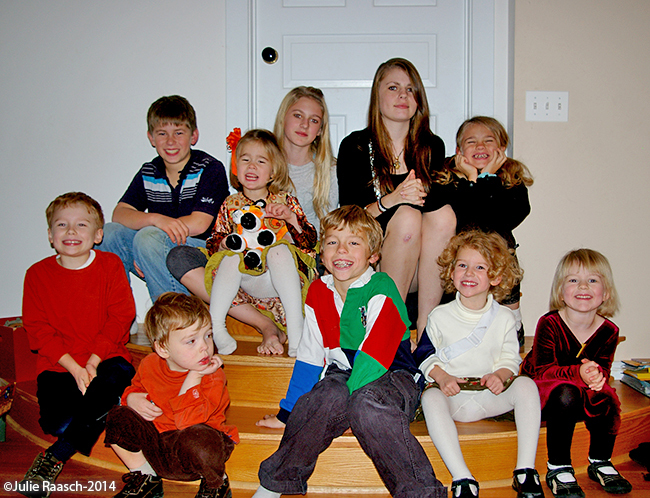 Nieces and Nephews in 2007. 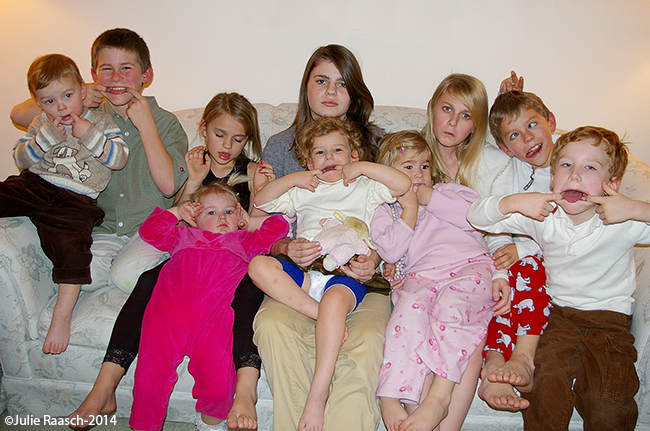 Nieces and Nephews in 2006… making goofy faces. Approaching the Circle, the clump of trees off to the right. There is just something refreshing and rejuvenating about visiting what I like to call the Circle. I’m surrounded by nature daily and love it. I walk around our 2-acre prairie almost every day and love seeing all the flowers… what is blooming now and watching the evolution of our work. Everyday I notice something and while it can be fantastic, I am always in the shadow of my life… of things that need doing. 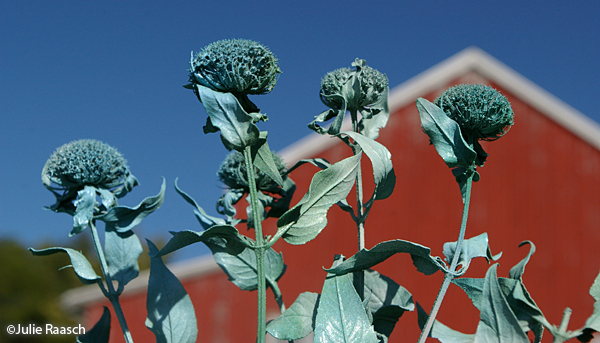 Weeds to pull, brush to clear, gardening, harvesting fruits and vegetables, getting ready for work… you get the idea. Lilly runs towards me, through the grass. When Lilly and I walk out onto the wildlife area next door, part of the Southwest Wisconsin Grassland & Stream Conservation Area, and out of site of our home it can be freeing. Some of this can be the newness and the chance to explore. 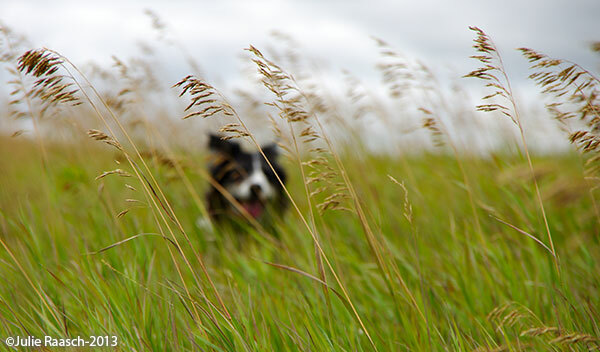 I walk and Lilly bounds across fields of mostly grass in the direction of the Circle. Lilly is just happy to be exploring, while I am enjoying the vistas. 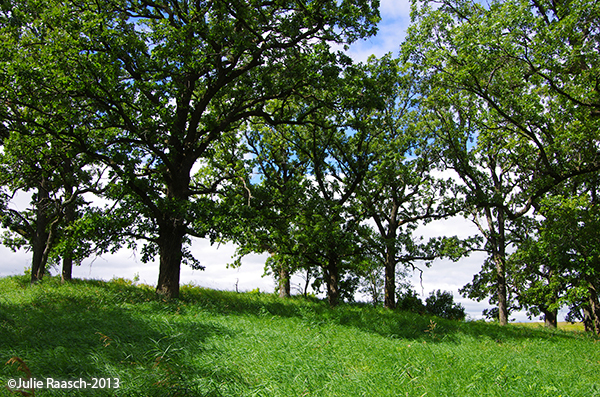 As we walk a clump of trees comes into focus… there a clumps on the horizons, but this group of trees is special. This group of trees is composed of ancient oaks. As we get closer I can appreciate just how majestic these trees can be. There are 10+ trees (really I’ve never counted them) that make up the Circle. 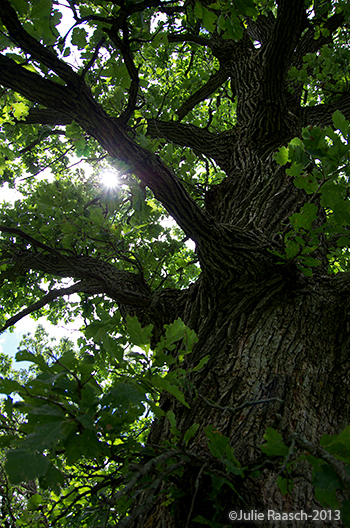 Most are open grown oaks with sprawling branches. There are at least 2 shagbark hickory trees in the Circle. As I wander from tree to tree looking at their structure and marveling at their height I get lost in the their beauty and rarity. It’s not that common to find a cluster like this. I suspect these trees once were part of a great savanna that rolled into the prairie we’ve been restoring. After wandering the Circle and enjoy the trees Lilly and I head home. Trekking over the grassland on the way back to our prairie I’m refreshed and at peace. Can it be that visiting the Circle (and taking photos) has brought this feeling? I like to believe so. Last month John and I took a road trip to West Bend, Wisconsin. Why? 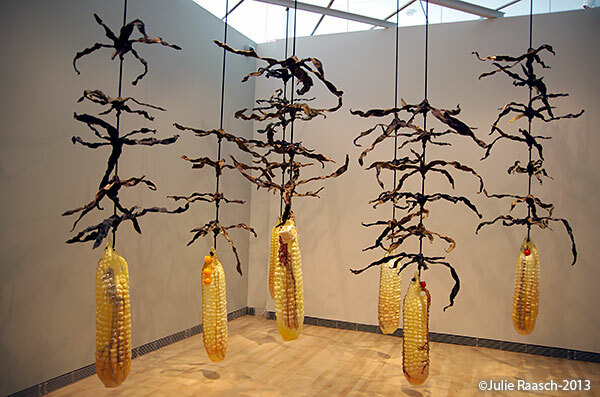 To see Antifragile, the exhibit of contemporary glass, and to visit the Museum of Wisconsin Art (MOWA). 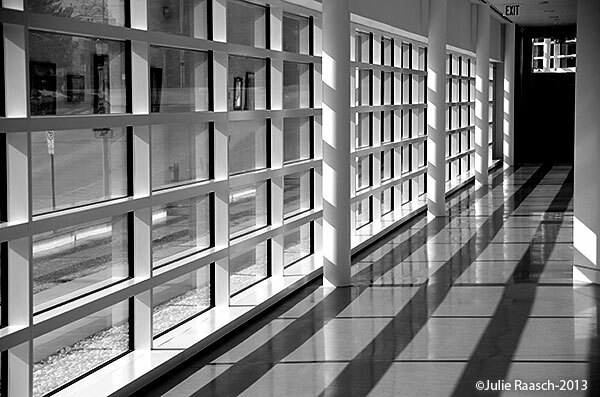 MOWA recently built a new building which is striking, especially inside. 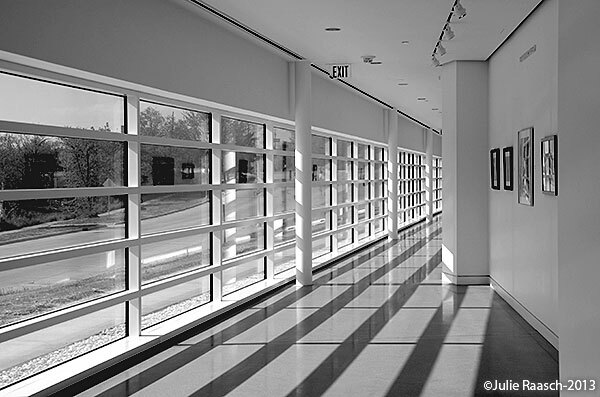 I was taken by the clean lines on the first floor… they look lovely in color, but the way the sun streamed through the windows created a drama that just begged to be seen in black and white. 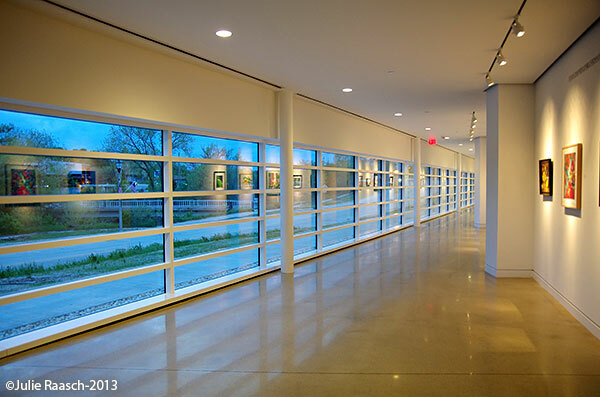 MOWA specializes in art from Wisconsin artists and the history of art in Wisconsin. It runs from classic work to contemporary. By going up the back stairs we started our tour with the earliest piece, a red and white quilt. We worked our way towards the exhibit we came to see… Antifragile. When almost to Antifragile we passed a contemporary work by Mary Nohl. Mary is a Wisconsin artist whose work I am familiar with from my childhood just outside of Milwaukee, WI. My friends and I would often visit the beach in front of her house and swim with her sculptures standing guard. Along our journey though Wisconsin’s art history we passed this piece of a 19th century panorama. I learned that Milwaukee and Chicago were the epicenter of an American panorama painting industry. They created enormous canvases that could be up to five stories high and were displayed in a circle. 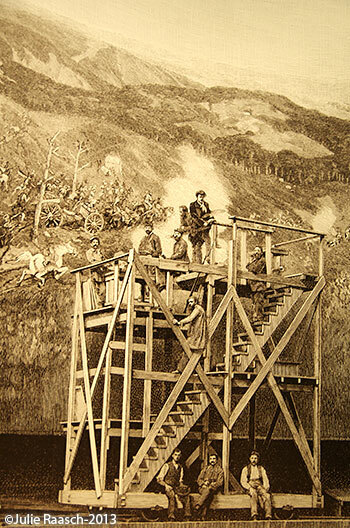 Visitors would enter the circle through an underground tunnel. When they emerged from the tunnel they would find themselves in the center of a 360-degree experience. Often props were set around the base of the canvas to increase the experience and add to the realistic feeling. I find myself captivated by this idea and think it would be fantastic to create such an experience. 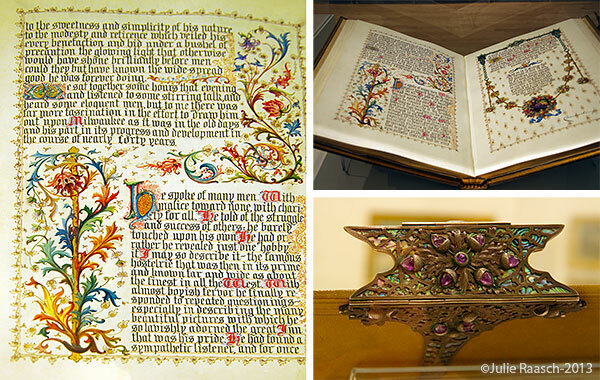 Several of Carl von Marr‘s paintings are on display in the museum. Carl was a Milwaukee-born painter who trained and spent most of his life in Germany painting. 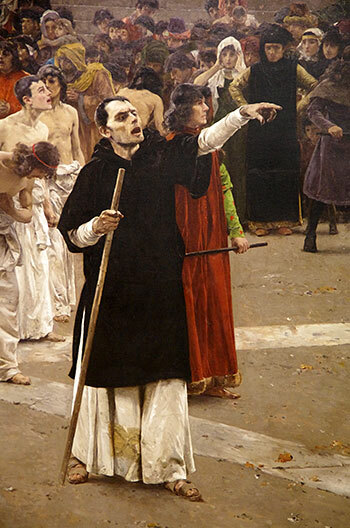 One of his most important works was The Flagellants. 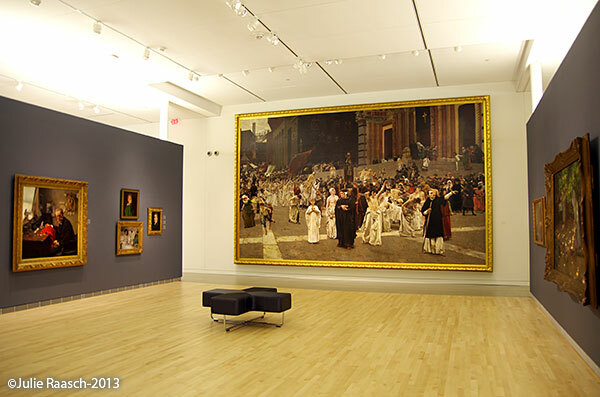 It was completed between 1885 and 1889 and measures 14’x23′. The Flagellants won an awards in Germany and was exhibited at the 1893 World’s Columbian Exposition in Chicago. 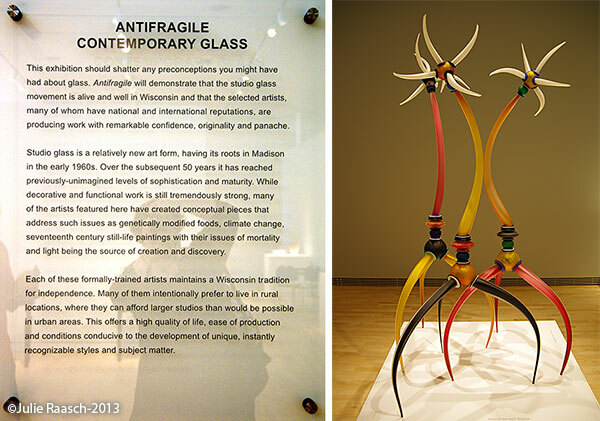 We ended our trip through Wisconsin art history with Antifragile: Contemporary Glass and a talk by two of the artists. 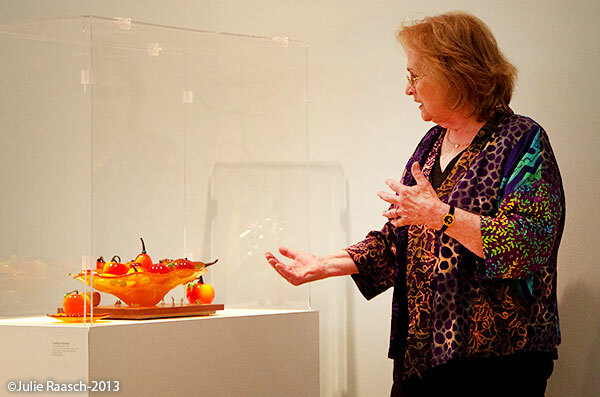 Audry Handler talked about her work and her experiences as one of the few women in the early studio glass movement rooted in Madison, WI. She talked about life in the all-boys club and how her experiences influence her work. 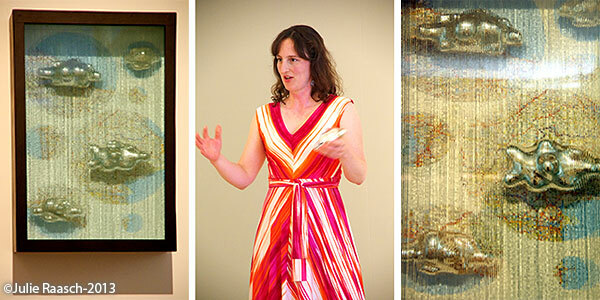 Lisa Koch talked about her work during the second half of the presentation. While Audrey’s work is a bit more traditional, Lisa’s work tends towards mixed media. 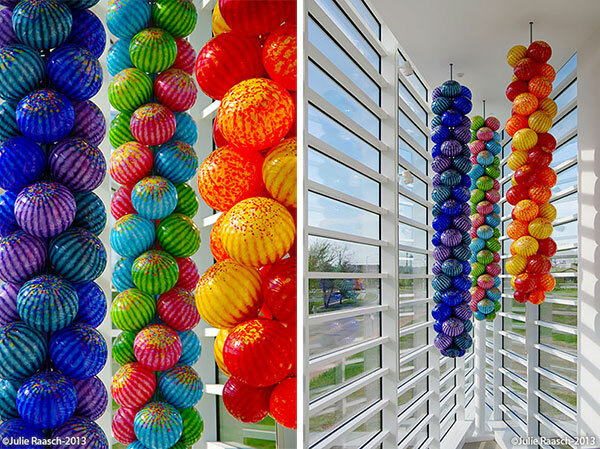 She has hand-blown glass shapes paired with wood, paper, and more glass. You can see her design training and illustration skills in her pieces. 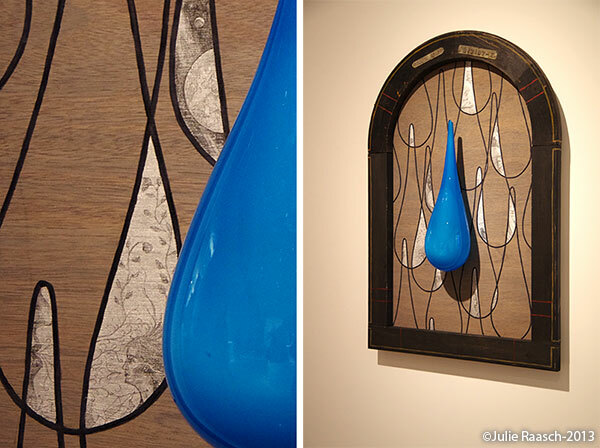 Within the piece with the blue water droplet you can see several lovely illustrations on the wood. I learned a lot on the walk through Wisconsin’s history of art. The experience was concluded with the entertaining and interesting talk given by both Audrey and Lisa about their artwork. 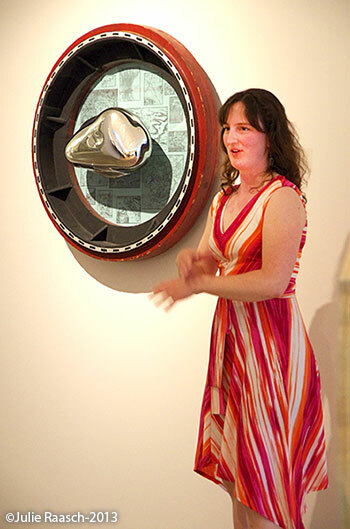 The Antifragile exhibition continues through July 28, 2013. Male cardinal singing from the top of a cherry tree on the edge of the prairie. Spring has finally arrived, at least in Southern Wisconsin. (Northern Wisconsin just received 12-18 inches of snow.) It took a while to get here. The snow kept hanging on. Last year spring was here before we could even register that winter had ended. This year it built slowly. Starting with an increase in noise level… It started with the cardinal, many of which overwinter here, singing from the tops of the trees. The bird’s song got louder and louder as more and more birds returned. This week the American Goldfinch returned. Once it was clear that spring had in fact returned I started my yearly pasque flower vigil. As things started to green up I feared that it would be a year without pasque flowers. I was afraid they might have been affected by last year’s drought. Things continued to green and I continued to worry… I kept thinking that it’s never this green when the pasque flower blooms. Finally, just after Earth Day, April 22, I noticed buds starting to push through the gravel and prairie grasses. A couple of days later I saw a couple of flowers start to open. A week later there were lots of flowers open… more than I remember seeing in previous years. Then there was the real surprise! Pasque flowers as they progressed from the ground to bud. We did it! We did it! We really did it! This year we had pasque flowers on and around the base of the prairie remnant! We had been collecting seed for the past 10 years from an area where there are pasque flowers and spreading the seed throughout other areas of the prairie. When living with a prairie things take time and you have to wait for them. 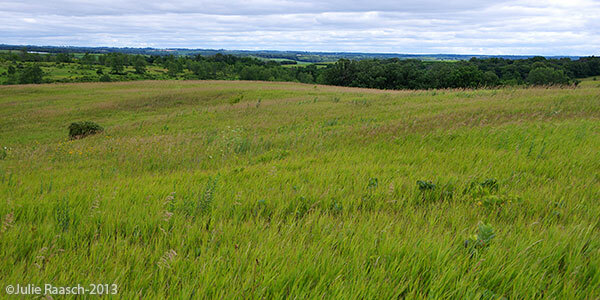 It can take years for a prairie plant to mature and flower. For this reason I need to keep my eyes open… you never know what you’ll find. April 10, 2011 – I noted pasque flowers were blooming. March 18, 2012 – The pasque flowers were already blooming… 2012 had a very early spring with a late spring frost that wiped out much of the apple crop and almost all of the sour cherry crop in Wiscosin and Michigan. 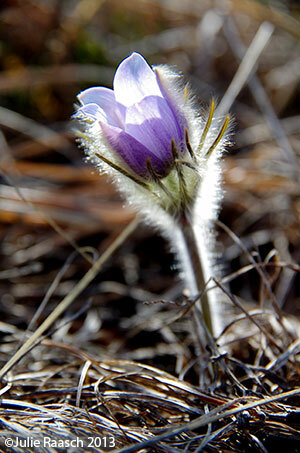 This year I did not see pasque flower bud until April 22, 2013. Pasque Flowers… note the one on the left has a spider that looks like the dried grass around the flower. To see more masque flower photos click here. 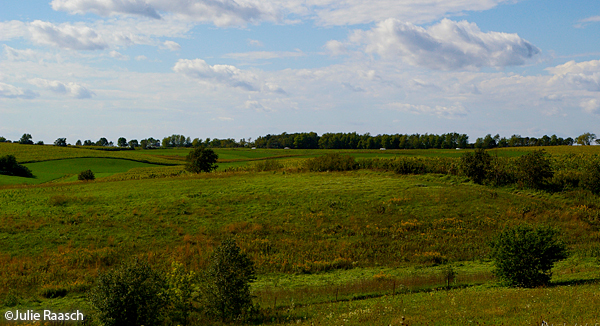 Looking out over the landscape and Folklore Village’s prairie. Yesterday was a beautifully sunny day with just a touch of fall in the air and I spent the day enjoying the Southwest Wisconsin Prairie Festival. There were talks about prairies, grassland birds, invasive species, badgers, prairie gardening, prairie walks, and creative exercises. While a lot of interesting things started between 10:00 and 10:30 am, the decision of what to do first was determined when we arrived too late to attend any of the first sessions. We did arrive in time to enjoy listening to the Prairie Promenaders and then Jerry Apps’s talk. 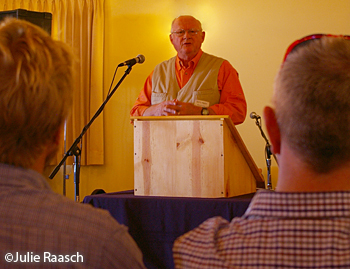 Jerry, story teller and rural historian, regaled us with stories of the land and encouraged members of the audience to discover the stories their land held. Following Jerry’s talk my husband, John went on 2 different prairie walks. 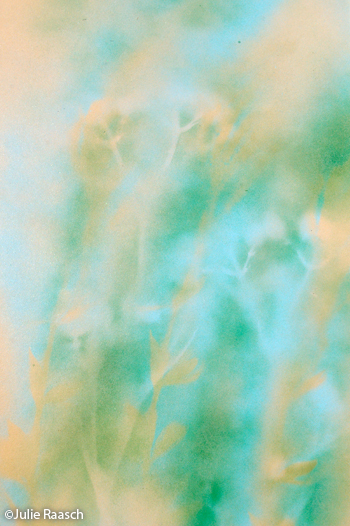 While he was out exploring the prairie at Folklore Village I was unleashing my creativity… basically I was playing. Lyric Ozburn was teaching a Creative Visual Arts workshop. The highlight of the session for me was playing with spray paint. It is said that sacrifices are made for art and yesterday what was sacrificed were some prairie plants. I had a lot of fun spraying boards with prairie plants laid on them. Creating wonderful silhouettes of the plants. Place plants flat on the foam core or poster board. Spray the paint towards the board, being careful to keep the nozzle about a foot away. The paint will hit the board wherever there is not plant material to block it. You will be silhouetting the plant. Move the plants or change the plants. Then spray another color. Repeat step 3 until you are satisfied with the results. Set the board aside to dry. – Always use spray paint in a well ventilated area. We worked outside on an inexpensive tarp. – Spraying too close to the board will result in puddling of the paint. – Try using colored boards as a base, just experiment and have fun. In enjoyed this project immensely… I played and was free. Creating board after board. Experimenting to see what works and what doesn’t. During the workshop we also played with watercolors, watercolor crayons, and water solvent oil pastels, but what was fantastic and freeing was the spray paint… home improvement store here I come! 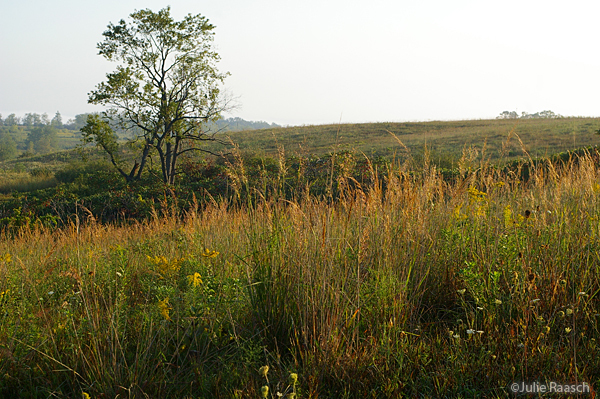 In the foreground is predominantly indian grass which is commonly found in tallgrass prairies. 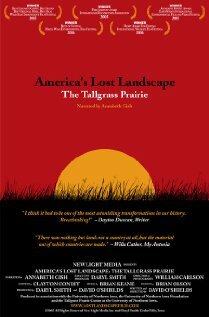 Over the last several months I’ve watched a couple of interesting prairie, land restoration and land ethic films. The first of these was ‘Greenfire: Aldo Leopold and a Land Ethic for Our Time.’ A documentary about environmentalist Aldo Leopold, how he grew into an environmentalist, the land ethic he lived by, and the work he performed. In addition the movie covered the influence he’s had on people and how he inspired people to pick up his torch and save their own little piece of the environment. ‘Greenfire’ has been played on Wisconsin Public Television several times and is available through the Dane County Library System. 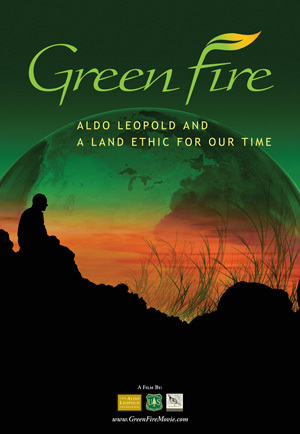 To find screening or by a copy of the DVD you can go to Aldo Leopold Foundation’s page for Greenfire. If you can’t make the film showing on Friday you may still want to come out to the Southwest Wisconsin Prairie Festival on Saturday, September 8. There are lots of activities planned: guided prairie walks; children’s activities; music and barn dance; Jerry Apps will speak, 4-H photography exhibit; adult art and photography lessons; and informational displays and talks. I know I plan to attend!